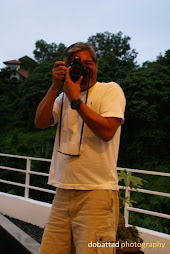 In the Philippine street scenes, particularly in the late afternoon until midnight, you will hear a familiar chant of vendors shouting, "Penoy - Baluuuuut! . . . " Then, a rush of balut enthusiasts and customers immediately encircle the balut vendor, each buyer patiently waiting his turn to be sold and savor this all-time favorite street food among Filipinos; a delicacy loved by millions of Filipinos since time immemorial, and a must-try for everyone visiting the Philippines. No trip to the Philippines would be complete without sampling our lowly and yet famous Balut. Balut is an incubated duck egg that is boiled and then eaten in the shell by gently tapping the pointed tip of the egg until it cracks open a small hole, just enough to shear-off the paper-thin sac where a juicy light-colored broth can be seen. The light-colored broth is actually the amniotic fluid of the egg which tastes a bit a cross between sweet and salty, and sipped with either a pinch of rock salt, or a dash of plain or spicy vinegar, or a combination thereof, to augment its flavorful and juicy taste as with the entire egg: the embryo, yolk, and white hard mass; consumed by slowly peeling-off the shell. To the uninitiated, the mere sight of the nearly-developed embryo with its grayish feathered head, beak, eyes, pinkish little limbs, wings, claws, and veins in between can evoke a mixture of disgust and awe. But when sampled, the partially formed skeleton of the embryo mixed with the broth is what gives the Balut its distinct crunchy and juicy taste. Balut is naturally rich in protein, vitamins and high-quality nutrients such as Vitamins A, D, B6 and B12, Thiamine, Riboflavin, Niacin, Folic Acid, Calcium, Phosphorus, Magnesium, Zinc, and Iron. While the nutritional content is higher than a regular chicken egg, a duck egg contains more cholesterol and the albumin or the white hard cartilaginous mass is high in uric acid content. In fact, the Balut is popularly regarded by Filipinos as a virility-enhancing and stamina-boosting aphrodisiac; a healthy evening snack, and as a delectable appetizer that perfectly goes with beer. 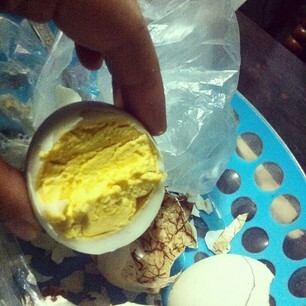 However, Balut with beer, they say, cause hypertension followed by headache. 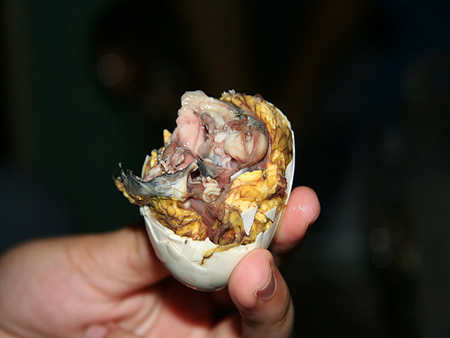 Expecting women are often discouraged from eating Balut as it is commonly believed that their babies might acquire Hirsutism or excessive hairiness. Balut (balot, depending on pronunciation) means "wrap" in Filipino. It is believed that Chinese traders and immigrants of old introduced the idea of eating fertilized duck eggs to the Philippines; from the Chinese "Maodan," meaning "feathered egg." However, overtime, the art of balut-making has been localized by the balut-makers, or the "magbabalut." 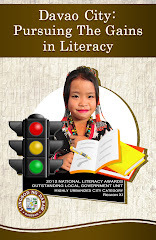 While there are now mechanized production to yield more and better baluts, much of the balut production in many parts of the country, is still done manually in the traditional way. There are actually two different kinds of incubated duck egg: the Balut, and "Penoy," and both are from Mallard Duck or "Itik" and are usually sold together. 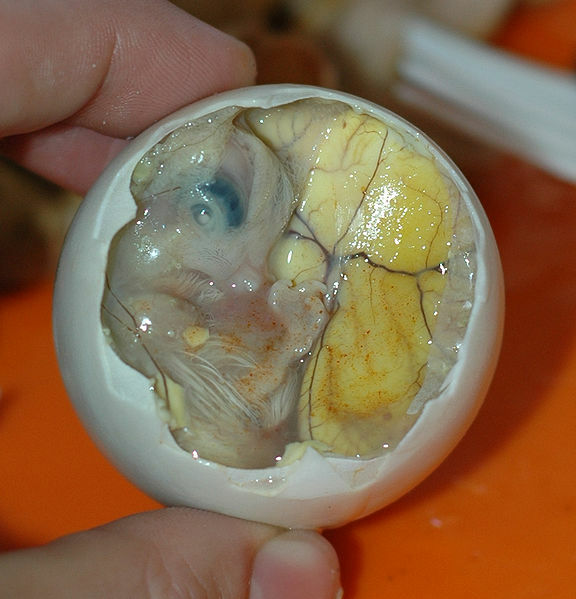 While the Balut is a nearly-developed embryo, usually 16 to 21 days old, the Penoy on the other hand is actually the by-product in the production of Balut after incubation. Instead of a nearly-developed embryo, the Penoy egg is only a soft mass of plain white and yellow embryo and, when boiled, the white portion would solidify and the yellow mass would coagulate. Great care and much attention is observed during incubation of the eggs. In traditional incubation, fertilized eggs are kept warm under the sun, wrapped upon layers of thick cloth and stored in wicker baskets to retain its warmth. After nine days, the eggs are held against a light to reveal the embryo, if any, inside the shell. Embryo development is easily distinguished by its shadow-like presence visible through a background light. A nearly-developed Balut of about 17-days old, without discernible beak, feathers, claws and underdeveloped bones, is considered an ideal balut, and is called "Balut sa Puti," meaning, "wrapped in white." An additional 3 to 4 days more will yield a distinguishable embryo, firm yet still tender when cooked. Approximately eight days later, the Balut are ready to be cooked, sold, and eaten. Duck eggs that are not properly developed after incubation are sold as Penoy, which look, smell, and taste similar to a regular hard-boiled chicken egg. Penoy usually produces two kinds of boiled egg: the masabáw (soupy), and the tuyô (dry). Penoy that is considered "masabáw" is not actually soupy, but rather moist and jellylike, while tuyô is nearly dry; somewhat similar in appearance to an ordinary boiled chicken egg. 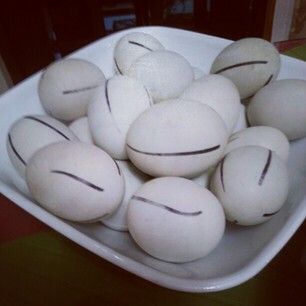 Balut vendors would usually put a distinguishing mark on the Penoy eggshell to easily differentiate a masabáw from the tuyô: the masabáw, has a straight and vertical pencil line drawn on the shell (sometimes a letter "S" for sabáw); and a crossing spherical line for the tuyô, while the Balut bears no markings. Balut is produced and sold in the streets all through out the Philippines. It is usually peddled by vendors the traditional way - walking around, on their arms holding a wicker basket filled to the brim with Balut and Penoy wrapped in layers of cloth to keep the eggs warm, accompanied by small packets of salt, usually of recycled graphing paper or in a small plastic bag, and a plastic bottle of spicy vinegar; or in a much convenient way, either peddled in a street corner in a metal or plastic container which holds more eggs thereby bringing in more profit, or through the use of bicycle, enticing buyers either through the traditional chant of shouting, or the use of horn. Either way, the Balut remains warm and fresh, ready to eat. To the more enterprising vendors, they also sell chicharon (cracklings) alongside with Balut. Over time, the lowly Balut, because of its unmatched popularity, and the ever-increasing interest of Filipinos in his insatiable pursuit of culinary arts, eventually evolved into haute cuisine served as appetizers in restaurants, cooked adobo or sinigang style, sizzling or stir-fried in omelettes, or even used as fillings in pastries. 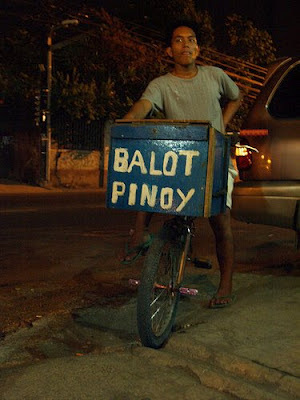 The imagination and possibility of more balut-based recipes are endless . . .